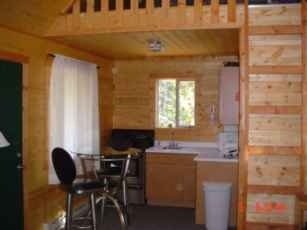 The Honeymoon Suite Cabin is secluded on 21 acres next to the Shoshone National Forest. We only have two other cabins on this 21 acres. 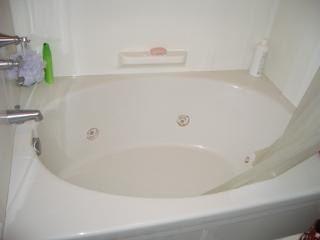 This Honeymoon Getaway is furnished with a Whirlpool tub, King Bed, Loft with a Queen Bed, Futon that opens to Full Bed, Full Furnished Kitchen with refrigerator, oven/stove, microwave, grill, coffee maker, etc., Remote Control Fireplace, 2 Fishing Rods, Satellite TV with DVD, Wireless Internet, and a Large Covered Porch. 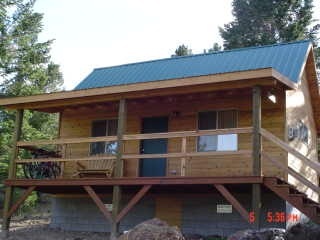 Since we are located next to the National Forest, you can hike, mountain bike, ATV, or snowmobile right from the cabin. There is a beautiful canyon short distance behind this cabin. We have a 90 day cancellation policy for June 1 - August 31 and 60 day cancellation policy for all other months for all cabins and rooms except the Plantation Home. The Plantation Home has a 120 day cancellation Period. You have up to 60/90/120 days before the arrival date to cancel and receive a full refund minus a $75 cancellation fee or 30% of your deposit, the larger of the two. If you cancel within the 60/90/120 days, your deposit is forfeited. If you cancel within 30 days of your arrival, you will be responsible for the entire stay. If you cancel within 60 days of your arrival for the Plantation HOme, you will be responsble for the entire stay. 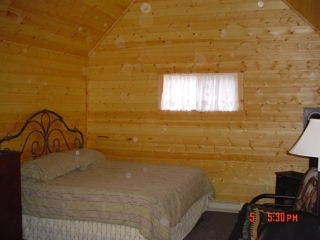 The beauty of our place is that it is only a few cabins providing a great deal of privacy. Being that we are not a motel chain, we do not provide vacation insurance. If you feel you may have to cancel within the 60/90/120 day cancellation period, please buy vacation insurance. All stays 5 or more nights, there is NO cleaning fee except for the Plantation Home. If your stay is less than 5 nights, there is a $75 cleaning fee for the Kitchen Kottage and the Honeymoon Cabin, and $95 cleaning fee for the Romantic Hearts cabin and Medium Family Cabin, and a $125 cleaning fee for the large family cabin. The Plantation Home has a cleaning fee of $175 if the entire home is rented as a cabin. Due to the size of the Plantation Home, we cannot waiver this fee. We are pet friendly. If you want to bring a pet, we have a ONE TIME $75 pet cleaning fee for the Kitchen Kottage and Honeymoon cabin and $95 for the Romantic Hearts and Medium Family Cabin and $125 for the Large Family Cabin. No pets over 25 lbs are allowed in any cabin and no pets allowed at all in the Plantation Home. This charge allows our cleaning crew to remove pet hair and steam clean the carpet to remove all pet hair/odor. Some of our guest are allergic to pet hair. Our Yellowstone cabins are on a maintained mountain road. June 1 - September 30 you can reach our cabins by car. We strongly recommend a 4wd vehicle between October 1-31 and May 1-20. We cannot be responsible for the weather. Please check the weather before you travel. If we get an unexpected snow storm, you will need a 4wd vehicle to get to the cabin. There is no smoking in any cabin. You are welcome to smoke outside and on the porch. We have the right to cancel a reservation at any time for any reason. We never had to do this and hope to never will. If our Pet and Smoking policy are broken, we can cancel your remaining stay at the cabin.